How did Pekin get its name? Here’s a chance to read again one of our old Local History Room columns, first published in December 2011 before the launch of this blog . . . The question of how Pekin got its name is shrouded in a haze of mystery and legend, but the resources of the Pekin Public Library’s Local History Room can help bring the question into better focus. All the standard reference works on the history of Pekin and Tazewell County affirm that Pekin was named in 1830 by Ann Eliza Cromwell, wife of Major Nathan Cromwell, one of Pekin’s earliest settlers. However, early accounts disagree about the year she gave Pekin its name. During the 1800s, “Pekin” was the standard English-language spelling of the Chinese capital, Peking or Beijing. Charles C. Chapman’s 1879 “History of Tazewell County,” substantially repeats the same account, though he dates Hodge’s survey to 1827 (apparently a printer’s error for 1829). “Doubtless with a prophetic eye [Mrs. Cromwell] could see a brilliant future for their town in the not far distant time, and, therefore, gave to it the name of Pekin, we suppose after the celestial city of that name,” Chapman comments. The story that Pekin was named after Peking (Beijing) appears to be an authentic tradition handed down by Pekin’s original settlers. Chapman quotes from the 1860 diary of Jacob Tharp, who came to Pekin in 1825. In his diary, Tharp gives an account of how the town’s proprietors (including Major Cromwell) surveyed and laid out the original town in 1830, and comments, “The gentlemen were much exercised about the way in which to lay off the celestial city.” His comment seems to be the earliest allusion to the story that Pekin was named for China’s Celestial City Beijing. “The Celestial City” has long been one of our city’s appellatives. However, these old accounts do not mention the “common legend” to which Soady refers, that Mrs. Cromwell believed Pekin was on the opposite side of the earth from Peking. Perhaps that legend is only a later embellishment of the original tradition. It is worth noting, however, that Pekin, Ill., and Beijing are at about the same latitude on the globe – about 40 degrees for Pekin, about 39 degrees for Beijing. Our city is not the only U.S. community with that name, nor was it the first. For example, Pekin in Washington County, Indiana, got its name around the same time as Pekin, Ill. There is also a small eastern Ohio community called Pekin, located near Minerva in Brown Township, Carroll County. Ohio’s Pekin may have received its name prior to 1815, judging from a statement in the 1921 “History of Carroll and Harrison Counties, Ohio.” Is it just a coincidence that Pekin, Ohio, is also at about the same latitude (39 or 40 degrees) as Pekin, Ill., and Beijing, China? Several of our city’s first settlers came from or through Ohio – but did any of them know about Ohio’s Pekin? Could that have been what suggested the name to Ann Eliza Cromwell? It might be a worthwhile project for a contemporary researcher of our local history to investigate that question. Early historical accounts indicate that Pekin, Ill., was named for the capital of China, Beijing or Peking. 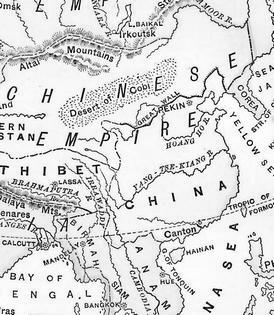 During the 1800s, a common English-language spelling of China’s capital was “Pekin,” as shown in this detail of a map from an 1874 grade school geography textbook, “Monteith’s Independent Course — Elementary Geography,” by James Monteith, page 62.